La Mouissone is a unique location as a backdrop for entertaining guests, for filming and photographic shoots, or as an exhibition site for outdoor art and displays. The garden makes a beautiful environment for garden photography, a relaxing evening reception or a lively summer barbecue. 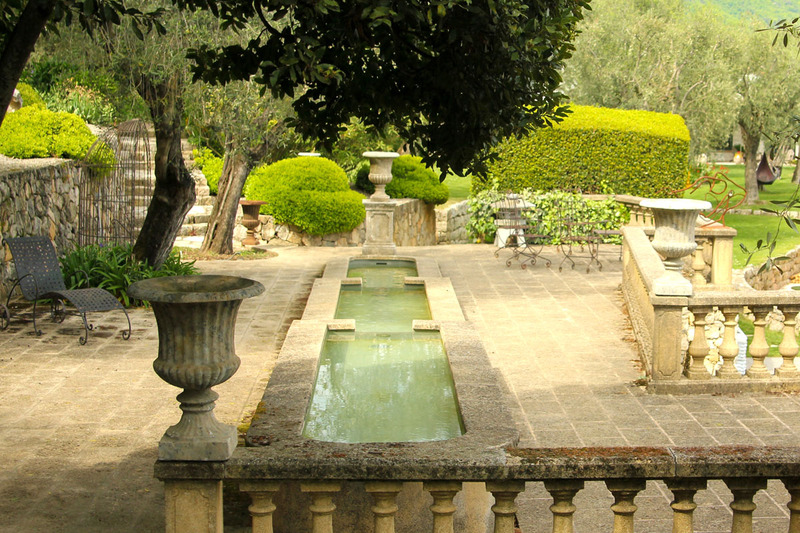 Visitors can have a glimpse of the British love affair with gardens – in the Mediterranean! In the gardens of La Mouissone, there are three main event areas, each with a different ambience. This gives the client the opportunity to choose a formal or relaxed style of reception and allows the event to proceed from one area to another. The different areas give a choice of style for your Special Event. 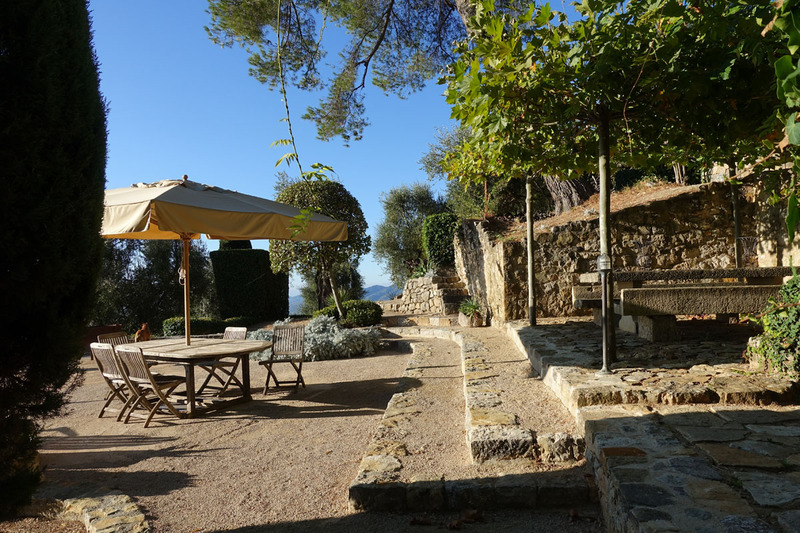 In hiring of the gardens for a reception, wedding or any special occasion, the Domaine becomes exclusive to the client for the period of the event. Anyone of the following areas can be the focal point for the entertainment of important guests. The main lawn is our largest reception area and overlooks the exotic garden, pool and the Mediterranean landscape to the sea. 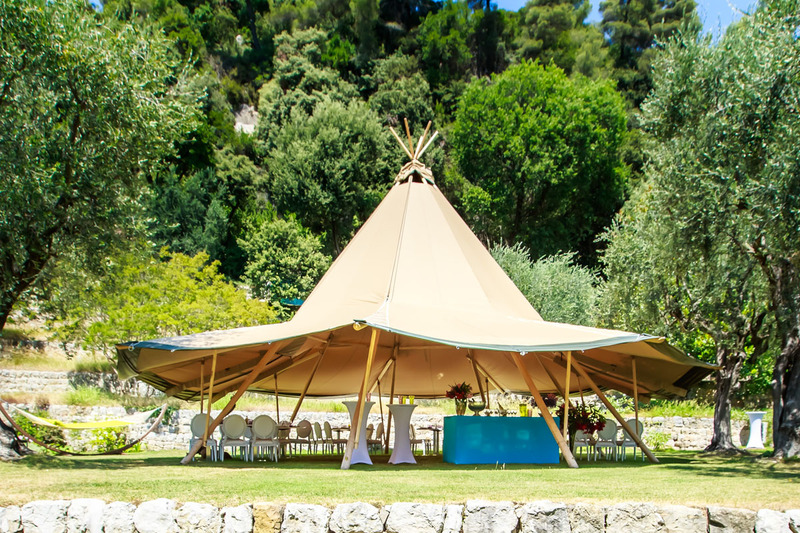 It is the perfect location for our unique Event Tent - the Tentipi. The structure is a Stratus 72 Tentipi. It is beautiful, strong and completely waterproof. An extremely versatile structure, it is an exciting choice for all types of events, large or small, in summer or winter. The barked wooden poles and the warm light through the canvas create a natural and cosy atmosphere. Constructed of natural canvas and wooden poles, the sides can be lifted to resemble a witch’s hat, or they can be tied down like a traditional tipi. 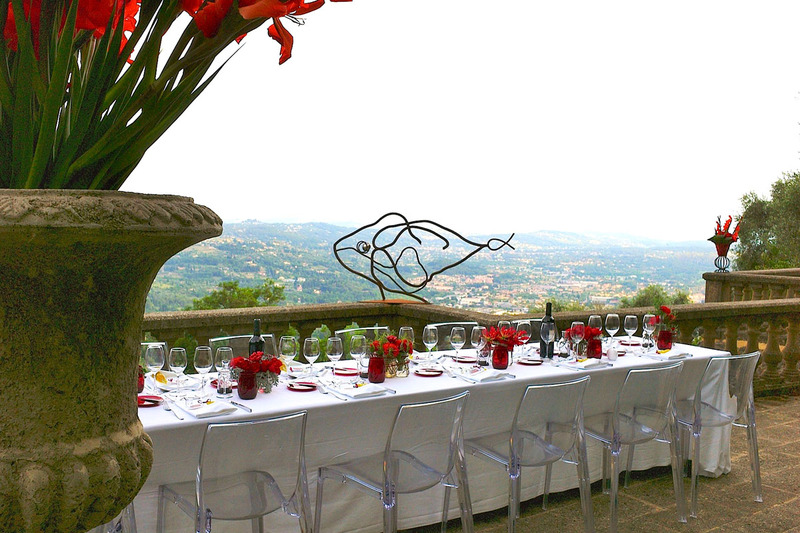 The Italian terrace is paved and overlooks the countryside down to the sea. There is a central basin water feature with gentle cascades providing a relaxing ambience for formal occasions. The terrace is ideal for formal lunches and dinners, cocktail parties, exhibitions. The Ruin is an informal location, ideal for more relaxed events such as barbecues, garden lunches, or even a drinks reception. There is a wonderful panoramic view of the landscape across to the Mediterranean coast. The Ruin is comfortable for 50 people seated at tables and 70 standing. We work closely with caterers, hire companies for presentation and event equipment, music and entertainment providers, lighting specialists... everything to make any event simply splendid! The Guest House may be made available to link in with events. Full accommodation details can be found here. The Chapelle de St. Christophe is right next to our main entrance. We have contacts with those responsible for the Chapelle and can assist you to make it part of your wedding or baptism event. The tipi measures 10.3m in diameter with its sides down and 13m with its sides up. In either format, it can accommodate 80 people. The flooring is an Ultradeck Eventdeck to give an even surface, covered with Dandydura polypropylene matting, colour ‘Corn’. A dance surface can be added as a chargeable extra. We can supply a basic lighting scheme for the Tipi. The reflection of light off the canvas provides a soft ambience that is pleasing on the eye. There are nearby water and electricity supplies. The terrace is comfortable for approximately 50 people, seated at long or round tables. The Ruin is comfortable for 50 - 60 people. There is a barbecue firepit (Kadai Fire Bowl with grill and gothic stand - diameter: 130cm and tripod with cooking bowl suspended on three chains). The Ruin is equipped with water and electricity supplies. For full details and our Terms and Conditions, please call Lady Lockett on 06 98 88 64 10 or email maggielockett@lamouissone.com. The gardens provide a photogenic and stylish lifestyle location for all types of visual media. Recent film shoots – an episode of the popular French TV series Section de Recherches. The gardens have several different environments which can provide a unique backdrop for outdoor exhibitions and displays. In May 2012, La Mouissone showcased recent works of Romanian sculptor, Alexander Paraschiv to present a cross-cultural exchange between the art of sculpture and the art of the garden. 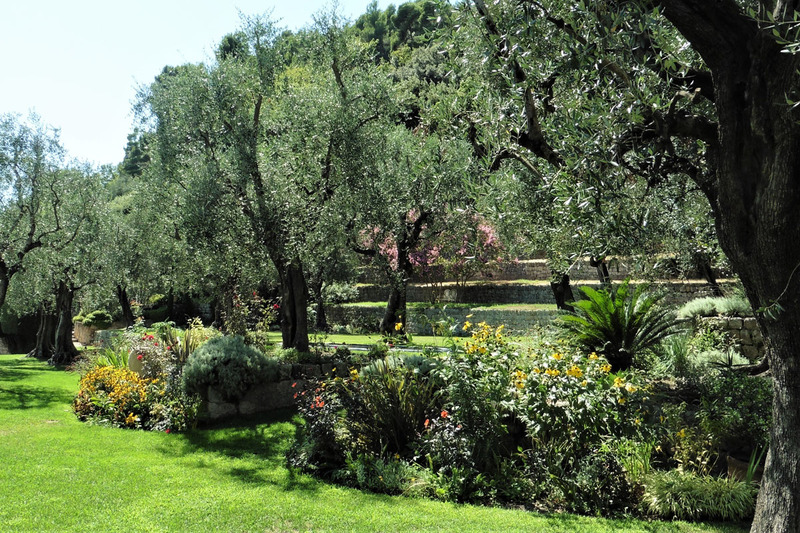 The works, set amongst the gardens within the olive grove, were created using reclaimed, aged and rusted reinforcing steel rods. As well as having created monumental sculptures in Romania and Japan, Paraschiv has works, which can be found in private collections in France, Austria, United States, Canada and Japan.